Your muscles produce more energy when you exercise, and the circulatory system's activity during exercise enhances the supply of fluids, oxygen and nutrients your muscles need for energy production. Exercising also increases your body's rate of various chemical reactions. The circulatory system works hard in helping your body to balance and maintain healthy chemical concentrations during exercise. Regular physical activity helps increase the efficiency of the circulation system's activity during exercise. Your muscles produce more energy as skeletal movements and contractions increase during exercise. Carbon dioxide is a toxic byproduct of energy production in your muscles. Your circulation system has chemoreceptors that detect changes in oxygen and carbon dioxide concentrations in your blood. Chemoreceptors send signals to your brain that increase your respiration rate when they detect rising carbon dioxide levels. Your circulatory system's veins work harder circulating waste-rich blood back to your heart during exercise; your heart contracts and pushes the blood into the pulmonary artery; and your lungs absorb carbon dioxide from the pulmonary artery and expel the toxic gas from your body each time you exhale. Oxygen demands increase during exercise because your muscles use oxygen to produce energy, and energy production increases during exercise. Oxygen also cools and prevents overheating as your body temperature rises during exercise. Your breathing rate increases, and your lungs take in more oxygen with each breath while exercising. 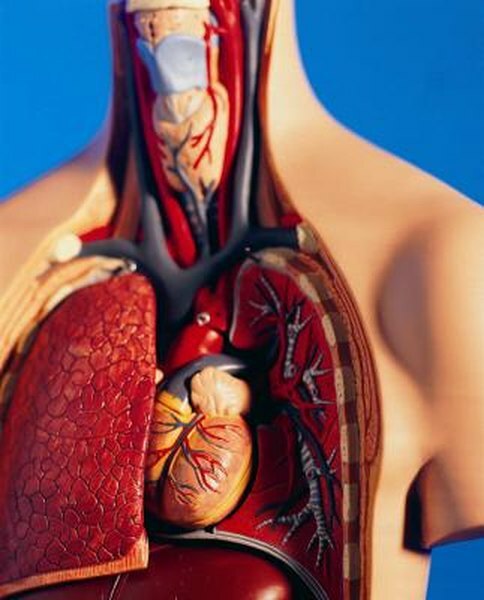 Your lungs deposit oxygen into your bloodstream, and the oxygen-rich blood returns to your heart. The heart contracts to push the oxygen-rich rich blood to organs and tissues throughout your body. Rising carbon dioxide levels and oxygen demands force your heart to contract more frequently, which increases your heart rate during exercise. Blood flow increases as your heart pumps more oxygen and nutrients through your circulatory system's systemic portion. The systemic circulatory system includes blood vessels that deliver oxygen and nutrient-rich blood to tissues throughout your body. Blood flows forcefully through your arteries and into capillaries, which release oxygen and nutrients into tissue cells. Waste products are collected by blood that flows into your veins. Your kidneys filter waste out of the blood, and the liver removes blood sugars before the blood finally flows back through the pulmonary artery and collects oxygen from your lungs again. Your circulatory system always tries to work efficiently -- particularly during exercise. Working muscles becomes your circulatory system’s top priority during exercise. The system restricts blood flowing to tissues and organs not working as hard, particularly your digestive organs. More resources are diverted to your skeletal muscles. Capillary beds in your muscles expand and deliver more than 12 times as much blood to working muscles during exercise. Your blood pressure increases during exercise because greater amounts of nutrient-rich blood flowing through your circulatory system increase pressure inside the blood vessels.